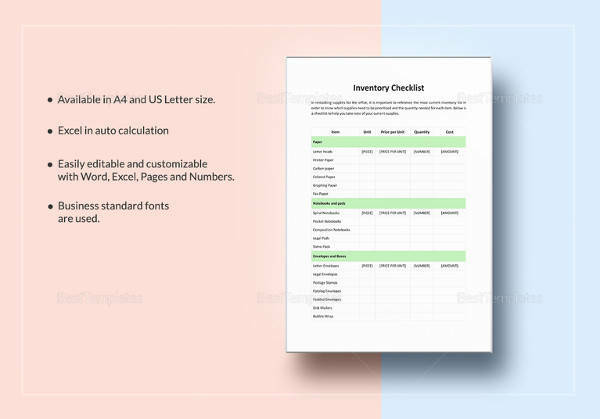 Inventory is mostly to create or to check all that items that an establishment or company has, also it includes the description/cost of it based on the inventory done and its usage. Food inventory is the most common catalog seen in business like in farms, Restaurant Inventory Template, food factories or in convenience stores. Usually consist of all the foods from raw to processed, it has the list of all the foods that are produced, delivered, cooked and sold to customers or clients.Many food establishments used this to check the foods that are sold frequently and those that are not, so the demand for the food will be monitored and the profit is achieved to what is desired. 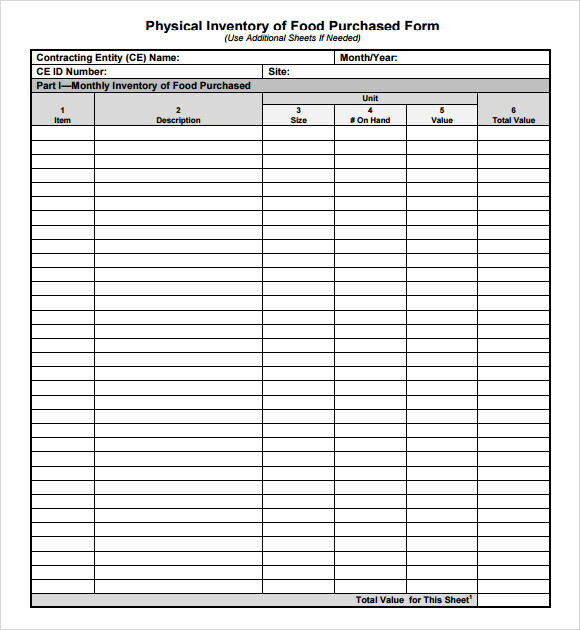 The food inventory form template provides you with the form which is to be filled in by you in order to keep the record of food inventory. It has columns for the details like the food item, the amount in hand, the amount needed and purchases to be made. 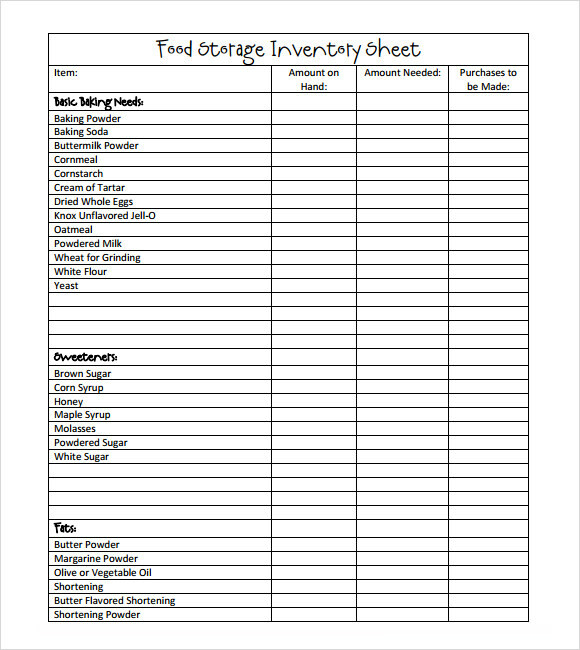 The food beverage inventory template is very easy to download and use. It has columns like the name of the item, can size and weight, on hand and want. 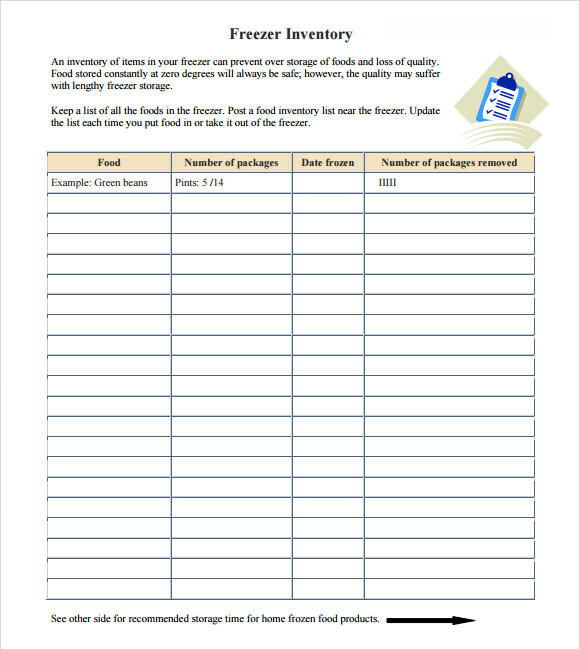 This template helps in neatly and effectively maintaining the food beverage inventory. 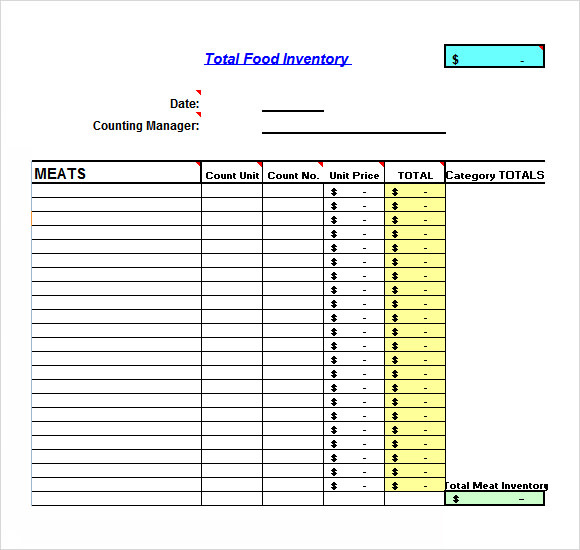 The food inventory excel template helps in maintaining the food inventory in excel file format. It has designated spaces for writing the details like date and counting manager. It also has columns like the meats, count unit, count number, unit price, total and category totals. Why is the Food Inventory Template Needed? 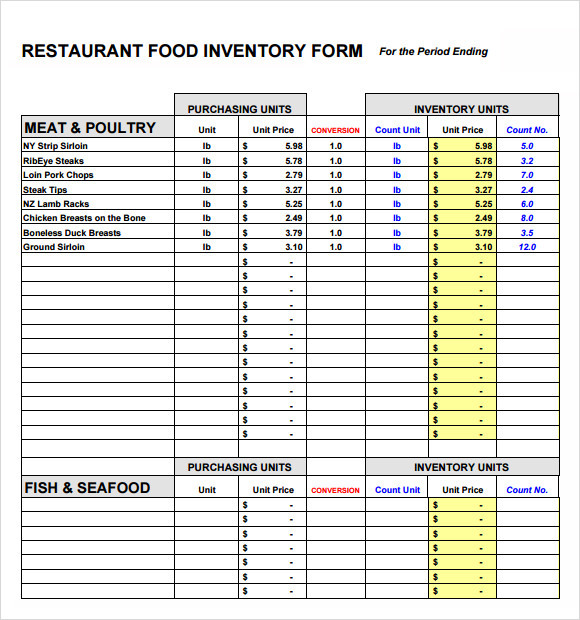 The food inventory template is needed for maintaining the record of the stock of available food and beverages. It also is needed to estimate the amount of more items needed to be purchased. It helps in knowing the demands of the food item also which further helps in increasing the profits. It is needed for updating the inventory time to time by going through the details like amount in hand and amount needed. It is useful in calculating the total cost of the food purchased over a time of period. When is the Food Inventory Template Needed? 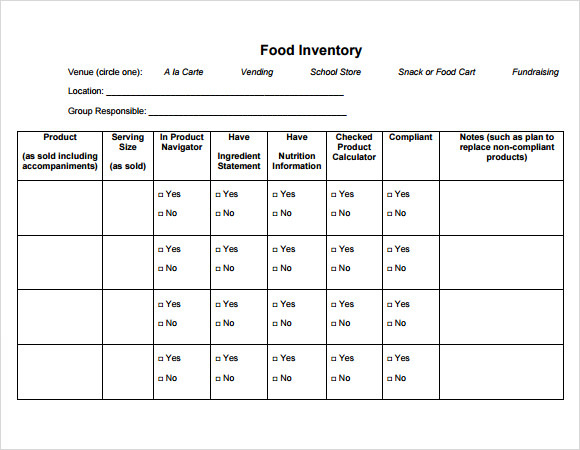 The food inventory template has various benefits like it helps to maintain the inventory in an organized way. It helps in making various estimations like the amount of item in hand, the amount of item to be purchased, the total cost of the item, the demand for a particular item by the customers and more. All these benefits prove to be very helpful in increasing the profits and reducing the expenses. It presents all this information in an organized manner which looks presentable and is easy to understand. 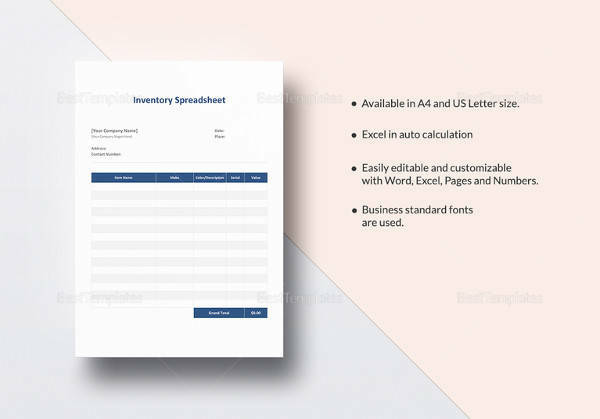 Along with all these benefits, this template simply helps in keeping the record of each and every item purchased. 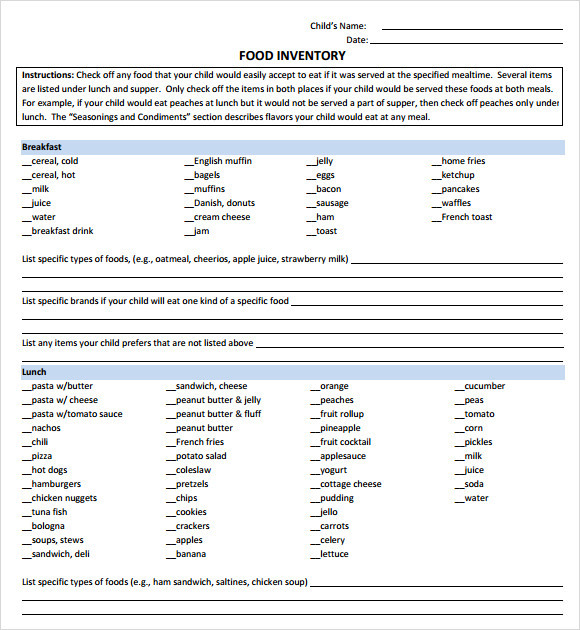 The food inventory template is very to use. It has designated spaces to fill in the required details. It also has designated spaces to fill in the details required. The different designs of this template help in providing you enough choices to choose the one that best suits your needs.